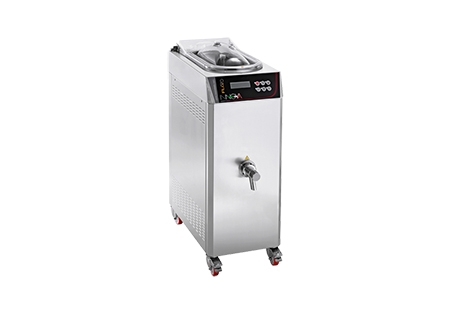 FLÙ is the pasteurizer for the professional ice-cream maker. The ideal machine that combines high performance, ease of use and state-of-the art technology, adopting to pasteurize the mix the "magnetic pulling mixer" technology with variable speed. The possibility to regulate the cycle ensures quality and hygiene for any kind of mix or syrup. The pasteurizer agitator unit can be completely dismantled, without mechanical support inside the tank, making maintenance and cleaning easy and quick.